James Pattinson, Peter Handscomb and Marcus Harris all appear Ashes bound after being handed Cricket Australia contracts. Selectors have announced a 20-man list of centrally contracted players, with Steve Smith and David Warner returning after a year where they didn't receive a cent following their ball-tampering bans. As expected, World Cup selection has been a key factor in the list, but most notable are the pointers towards the Ashes. Pattinson has not played a Test since 2016, but has been picked on the Australia A one-day and four-day tours and the fact he has been handed a contract is the surest sign yet that he looks set to be picked for a stunning Ashes comeback provided his body stays healthy. Opener Harris' position had gone from locked in to looking slightly contentious after he struggled against Sri Lanka while others like Joe Burns and Kurtis Patterson grabbed their opportunity. 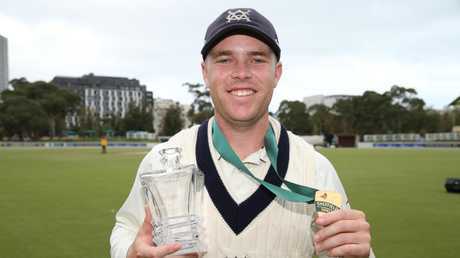 But Harris has been rewarded for his 1000 run Sheffield Shield season and appears certain to be in the Ashes squad after being given a contract and named for Australia A.
Handscomb is also firming to be the back-up Ashes wicketkeeper after earning a central contract. This is despite the fact he was ultimately left out of the World Cup squad of 15 and was not part of Australia's most recent Test series against Sri Lanka. Marcus Harris posted more than 1000 Sheffield Shield runs this season to stake his Ashes claim. The contract - and selection for Australia A - is an overwhelming sign that Handscomb is firmly in Australia's Ashes plans. The big omission from the contract list from last season is Mitchell Marsh - who has gone from one of Australia's highest paid cricketers to no longer getting a central contract. Australia's A squad to tour the UK at the same time as the World Cup has allowed selectors options if there are injuries in the main 15. Unlucky to not be picked in the first place, the likes of Ashton Turner, Handscomb, Josh Hazlewood and Kane Richardson could be rushed straight in if a World Cup player was ruled out with a tournament-ending injury. Mitchell Marsh’s fall from grace has been swift and emphatic, left off the contract list entirely. Matthew Wade has a golden chance to push for Ashes selection after being picked in both Australia A one-day and four-day teams. Will Pucovski also features in the A squads and remains a chance. However, selectors have cast the net as wide as they possibly could in the hunt for their final Ashes party. Joe Burns, Cameron Bancroft, Marnus Labuschagne, Matthew Renshaw, Peter Siddle and Daniel Worrall were all left out of the Australia A side - but only because they have English county deals. 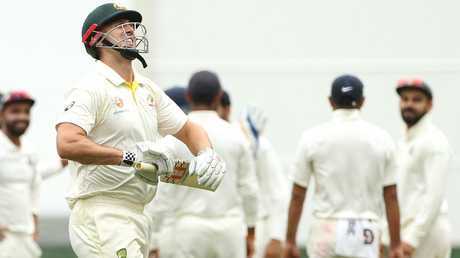 Australian selectors will afford them the chance to play regular games with their counties but have declared they're in contention for Ashes selection if they perform. Tim Paine will captain the Australia A squad in the four-day games but won't play in the one-dayers. premium_icon Revealed: Smith, Warner locked in, who missed out? Crime TWENTY years ago, Treasa Steinhardt dropped her daughter off at school. It was the last time she would ever see her. © The Warwick Newspaper Pty Limited 2019. Unauthorised reproduction is prohibited under the laws of Australia and by international treaty.